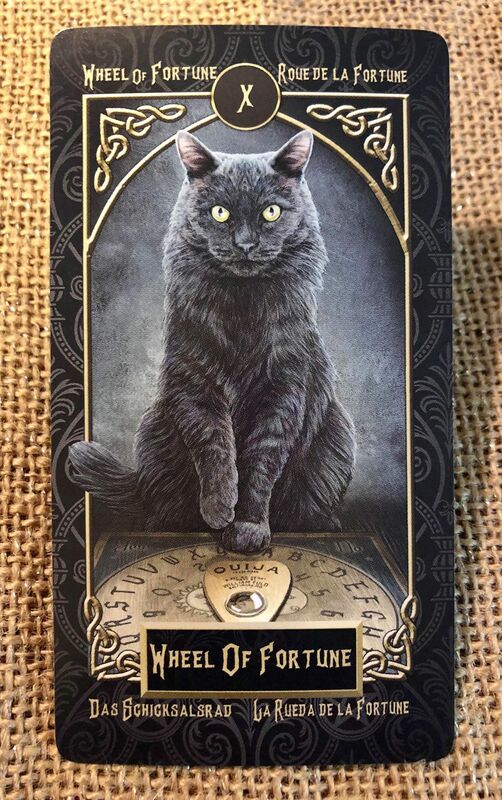 I find the spirit board an interesting choice as I typically see them associated with spirit communication instead of divination, however, the unadorned black cat is perfect as what it represents depends on the culture and situation. The Scots associated it with prosperity and as good luck in Japan. In Western culture, it often is seen as bad luck, though sometimes it depends on which direction the cat is walking. And, of course, Egyptians had Bast, who is depicted as a woman with the head of a black cat. Of course, those of us who have a witchier approach to life often love having a black cat around, though I personally like most cats. Remember to keep an open mind about the black cat and consider your fate or fortune. Blessings! This card represents the spirit facing the fate. Typically, it means destiny, fortune, outcome, special gain or unusual loss, result, conclusion, or inevitability. It could also indicate failure, an interruption, or inconsistency due to an unexpected event.